Vernon Hargreaves is an American professional football cornerback who started playing for the Florida based Tampa Bay Buccaneers after being selected 11th overall in the 2016 National Football League (NFL) draft. Vernon Hargreaves got a five-star rating from Rival.com and was projected as the nation’s best cornerback recruit as well as the second-best overall player. In 2013 during his high school senior year, Hargreaves earned the MVP honors in the Under Armour All-American game, after committing to the Gators. 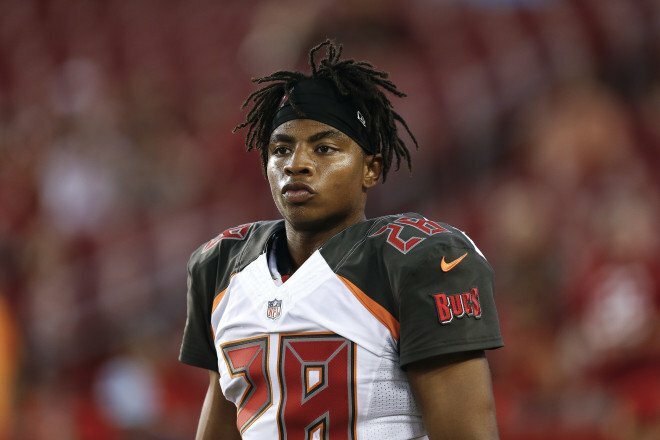 Vernon Hargreaves III was born on June 3, 1995, in Tampa, Florida, to parents, Vernon Hargreaves, Jr. and Jackie Hargreaves. He was raised in a football family alongside his two sisters Chanelle and Carina thus, he had a solid background in sports. His father was a former college football standout at the University of Connecticut, who became a linebackers coach at Miami from 1998 to 2005; coached at Tampa’s USF for two years from 2010 to 2012 and then coached at Houston in 2013 and 2014. Growing up in Tampa, Hargreaves attended Wharton High School where he started playing football. He combined studies and sports, competing in both track and football. From sophomore to senior year in high school, Hargreaves made a total of 203 tackles, 2 sacks, 9 interceptions and 11 offensive touchdowns. Not only football, during his senior year, he competed in track & field and made quite an impressive record in the 200-meter dash at the Hillsborough County National Division, with a personal-best time of 22.56 seconds; placed fourth in the 100-meter dash; twelfth in a 1.78 m high jump; and second place in 6.79 m long jump. With an excellent sports record, Hargreaves received dozens of athletic scholarships from major high league universities, but he opted to stay close to home and accepted that of the University of Florida. He played as a cornerback for the Florida Gators Football team in Southeastern Conference, SEC competition for three consecutive years from 2013 to 2015. Starting out as a college true freshman in 2013, Vernon Hargreaves played 10 out of 12 games with 38 tackles and 3 interceptions and earned first-team All-SEC honors at the cornerback position. During his sophomore and junior years, he played in 24 games with 73 tackles, seven interceptions, three forced fumbles and 15 passes defended. As is customary with most American football players, Hargreaves announced he’s skipping senior year to enter for the 2016 NFL Draft. He debuted his professional football career with the Tampa Bay Buccaneers who selected him 11th overall, in the first round of the 2016 NFL Draft to play cornerback. He signed a guaranteed 4-year contract of $14.17 million including a bonus of $8.51 million with the Buccaneers on May 6, 2016. His first match in the Tampa Bay Buccaneers’ season-opener at the Atlanta Falcons was a massive victory as he made two combined tackles. He was retained as the cornerback by head coach Dirk Koetter to begin the 2017 regular season, during which he scored another 25-23 victory with the team against the New York Giants. Hargreaves attained a career-high that season on October 1 with nine solo tackles and defended a pass. The following month, precisely on November 12, Hargreaves sustained a hamstring injury in the third quarter of Buccaneers’ 15 – 10 victory match against the New York Jets. He made three combined tackles before exiting the game and remained inactive for weeks 11 – 15, missing five games before Buccaneers placed him on injured reserve on December 20, 2017. In total, Hargreaves played in nine games and eight starts and finished his second season with five pass deflections and 42 combined tackles (37 solos). Strengths: NFL analysis of his strengths shows Hargreaves has an outstanding body control and balance with electric feet. He is described as a premier, quick twitch athlete with explosion pulsing through his feet and hips, enabling his ability to explode forward and attack the throw. He doesn’t stay block and is quick in run support and against wide receiver screens; quite a fiery competitor and chest-up tackler who runs through his target. Weakness: His lean, wiry frame and height are reported a constant contemplation for scouts, thus big receivers pose a challenge on the next level. Aggressive approaches towards the game make him vulnerable to baits and his willingness to throw himself around in run support leaves him susceptible to break down.Nevertheless, Hargreaves does not cease to impress with his consistency and competitiveness in the field, earning him wide admiration. It is resolved that Vernon Hargreaves III possesses the football agility to become a Pro Bowl cornerback.